The SR11, manufactured by Hukseflux Thermal Sensors and cabled by Campbell Scientific, is an ISO-first-class pyranometer that monitors solar radiation for the full solar spectrum range. It produces a millivolt signal that is measured directly by a Campbell Scientific data logger. The SR11 can provide solar radiation measurements for a variety of meteorological applications. 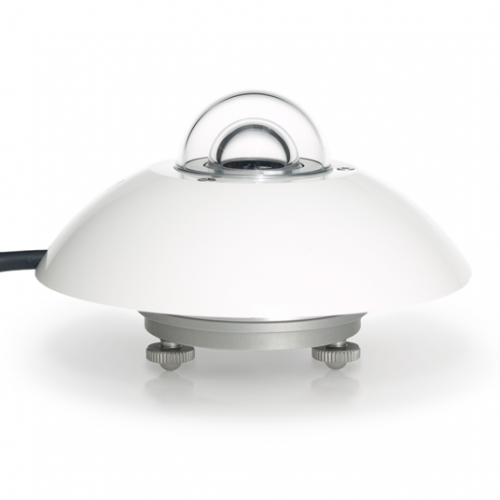 The SR11 measures solar radiation with a high-quality blackened thermopile protected by two glass domes. The blackened thermopile provides a flat spectral response for the full solar spectrum range, which allows the SR11 to be used under plant canopies or lamps, when the sky is cloudy, and for reflected radiation measurements. The SR11 includes a bubble level, three adjusting screws, and a cable gland. The bubble level and adjusting screws allow the sensor to be leveled without using a leveling base. The gland facilitates cable replacement. Two SR11 pyranometers can be mounted back-to-back to make a low-cost albedometer. Because the SR11 is a first-class pyranometer, it is acceptable for providing the solar radiation data used in stability estimations (EPA Meteorological Monitoring Guidance for Regulatory Modeling Applications, pages 2-10). The SR11 should be mounted away from all obstructions and reflective surfaces that might adversely affect the measurement. It typically mounts to a mast, crossarm, or pole (2.54 to 5.33 cm [1.0 to 2.1 in.] OD) via the CM255 or CM255LS mounting stand. 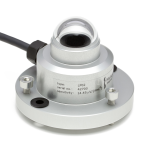 The CM265 mounting kit is also available if mounting the pyranometer near the end cap of the NexTracker Torque Tube.